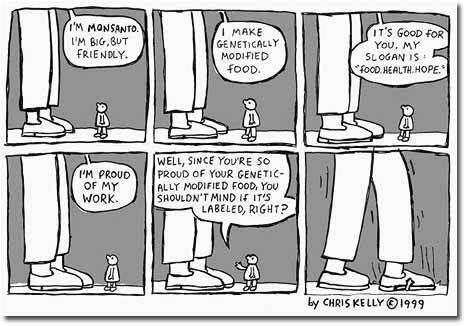 We run on Monsanto. Soon, the world probably will too unless government finally gets out of bed with them. Monsanto is a biotech company specializing in genetically modified organisms, or GMOs as they have come to be known. Lately, Monsanto has been credited with ruining the lives of farmers and developing a practical monopoly on most corn, soybean, cotton, wheat, canola and sugar cane crops. Recent statistics show that about 80% of all genetically modified foods originate from Monsanto. Here’s a little background information on Monsanto and an introduction to their “mission and accomplishments.” Monsanto has a patent on their genetically modified crops that they tout as factors in saving world hunger and making our world “greener.” Monsanto and many other big agriculture companies use bacillus thuringiensis (BT) in their crops, which is a biological alternative to pesticide and insecticide , thus preventing creatures from destroying a large portion of the crop. BT also increases the crops’ stress tolerance to acidity, drought, etc. Monsanto’s BT cotton saves 2 million gallons of pesticides annually in the US alone. As a result of all biotech crops combines, nearly 300,000 metric tons of pesticides have been avoided and 15 billion kilograms of carbon dioxide saved. Another example: rice-dependent cultures face major problems with their diets because milled rice has virtually no vitamin A. Hello, “golden rice.” Golden rice is a genetically modified species of rice that includes vitamin A and could potentially save the lives of 200 million people who have deficiencies and over 500,000 victims of blindness each year. So this evidence suggest that agribusiness companies like Monsanto couldn’t be all that bad, right? Especially when you have people like Bill Gates as a member of the support crew. But, now that I’ve at least mentioned the potential benefits of Monsanto’s efforts, I can begin discussing the much longer list of problems that these efforts are causing. A court case that received huge media attention was Monsanto vs. Schmeiser. Percy Schmeiser was an organic Canadian farmer against GMO crops. However, his neighbor was growing Monsanto’s GMO crops and wind, water, or something swept some of his neighbor’s seeds into his crop. The seeds cross-pollinated and on one of Monsanto’s routine spying sessions, they discovered Schmeiser’s farm contained their patented seeds and Monsanto sued Schmeiser. Schmeiser had no idea this was happening, not did he want it to happen Though Monsanto seeds contaminated his crop, he was sued for patent violation. The court initially ruled that the seed was Monsanto’s property and it did not matter how it ended up on Schmeiser’s farm. In the end, Monsanto paid for clean up on Schmeiser’s farm, but he had already gone practically bankrupt spending his life savings on litigation. Since this case, over 2000 Canadian farmers have been sued by Monsanto and over 1000 have filed suit against them for contaminating their crops. The seed patent prevents anyone from making, saving, using, or developing the patented product. 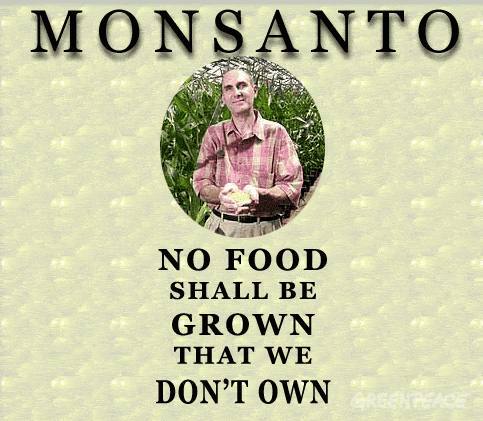 Monsanto requires that farmers buy seeds each year and forbids the saving of seeds. A farmer saving seed is treated as an intellectual property thief even if his land is unknowingly contaminated. So, basically Monsanto has control of the seed through patents, and control of the rest of the food through contamination. Fun Fact: Monsanto sets aside $510 million a year to pay for investigations and suits against farmers who aren’t paying their patent royalties. The company literally sends detectives to collect samples from farms and have helicopters that roam over farmers’ land to inspect. If what Monsanto is doing to small farmers is legal, what does this say about our patent system? Despite not knowing about their accused infringement, farmers are charged and prosecuted for something that was entirely out of their control. It appears that companies like Monsanto are simply using the patent system to acquire monopoly control of products that we have used for hundreds of years. Who would have thought we would actually start patenting our food? And when a corporation clearly in search of profit is controlling something necessary to sustain human life, this becomes a much more serious issue than patenting software, etc. And despite the scale of this issue, government has yet to take action and has left it up to small farmers to try and make any changes. Obviously, small farmers do not have the deep pockets to litigate against big corporations like Monsanto and are forced back into submission. Hopefully now that Monsanto’s patent abuse is on the national and international radar and their patent term is coming to a close, the government may be more willing to reform. As more bad media attention targets Monsanto, people have hope that they might actually get a slap in the face. In 2009, Forbes named Monsanto Company of the Year. After America had a collective aneurism, Forbes retracted their selection and admitted its mistake. Regardless, Monsanto is currently encouraging farmers to commit to planting their second version of soybeans, because its existing patent on the first version will expire in 2014. We’ll see what happens there. if the little guy is entirely, legally in the right, he cannot afford to defend himself and must simply fold to the man with bigger pockets.